A tianguis is an open-air market, specifically an itinerant market which springs up in a certain place for just one day of the week. The word is the same whether used in the singular or plural. This term is used exclusively in Mexico and Central America and not in other Spanish-speaking countries. The word tianguis comes from the Nahuatl (the language of the Aztecs) "tianquiztli" which means marketplace. It differs from a "mercado" in that the mercado has its own building and functions every day whereas a tianguis is set up in the street or a park for one day of the week. In some areas, a tianguis may be referred to as a "mercado sobre ruedas" (market on wheels). The vendors arrive in the early hours of the morning and in a short time set up their tables and displays, a patchwork of tarps suspended overhead protects from the sun and rain. Some vendors will just lay out a blanket or mat on the ground with their items to sell, others have elaborate displays. A wide variety of products is sold in the tianguis, from produce and dry goods to livestock and mass-produced items. Some specialized tianguis will sell only one particular type of merchandise, for example, in Taxco there is a silver tianguis every Saturday at which only silver jewelry is sold. Tianguis are common throughout Mexico, both in rural and urban areas. A variety of different items was used as currency in the markets in ancient times including cacao beans, shells and jade beads. Barter was also an important exchange system, and still is today, particularly between vendors. The tianguis is not just about economic transactions. 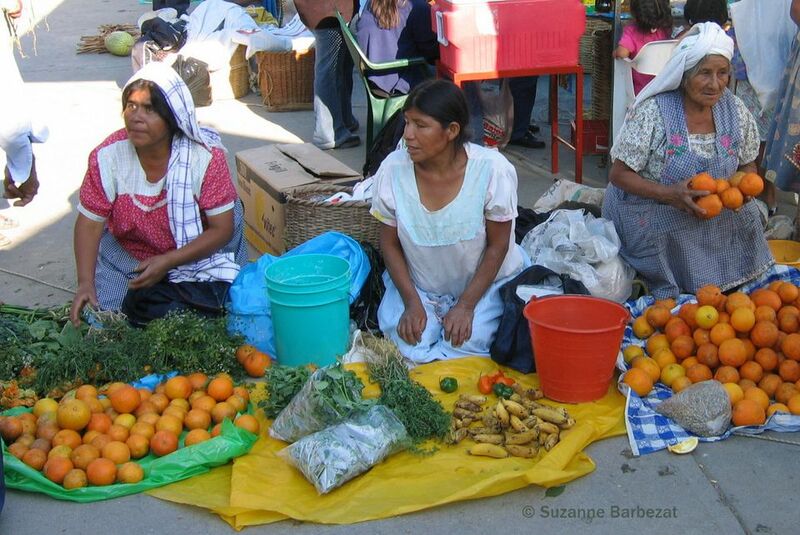 Unlike when you shop at a supermarket, in the tianguis each purchase brings with it a social interaction. For people who live in rural areas, this is their main opportunity to socialize. The term día de tianguis means "market day." In many areas of Mexico and Central America, it is customary to have rotating market days. Although usually, each community has its own market building where you can buy goods every day, the market day in each village will fall on a particular day of the week and on that day there are stalls set up on the streets surrounding the market building and people come from the surrounding areas to buy and sell on that particular day. The custom of rotating markets dates back to ancient times. When Hernán Cortes and the other conquistadors arrived in the Aztec capital of Tenochtitlan, they were amazed at how clean and well-organized it was. Bernal Diaz del Castillo, one of Cortes' men wrote about everything they saw in his book, True History of the Conquest of New Spain. He described the vast markets of Tenochtitlán and the goods on offer there: produce, chocolate, textiles, precious metals, paper, tobacco, and more. It was precisely these extensive networks of exchange and communication that made the development of complex societies in Mesoamerica possible. Learn more about Mesoamerican merchants. Is Chilango an Insult to People From Mexico City? How Did Day of the Dead begin?